Welcome to the Demkov Materials Physics Group! Our current research is focused on the physics of oxide heterostructres. We work on the quantum theory of real materials, and molecular beam epitaxy (MBE). We do both theoretical and experimental research. Owing to the complexity of these problems, our research requires high performance computing, most of which is done at the Texas Advanced Computing Center (TACC), and the state of the art MBE Lab . Below and to the right is a list of our most recent papers (a full list is available under the publications tab). We are always interested in recruiting new students who are interested in condensed matter physics, and hope you will consider our group for your studies. Our recent paper on the piezoelectric modulation of the NLO response of BTO thin films was featured on the cover of the September issue of Applied Physics Letters! 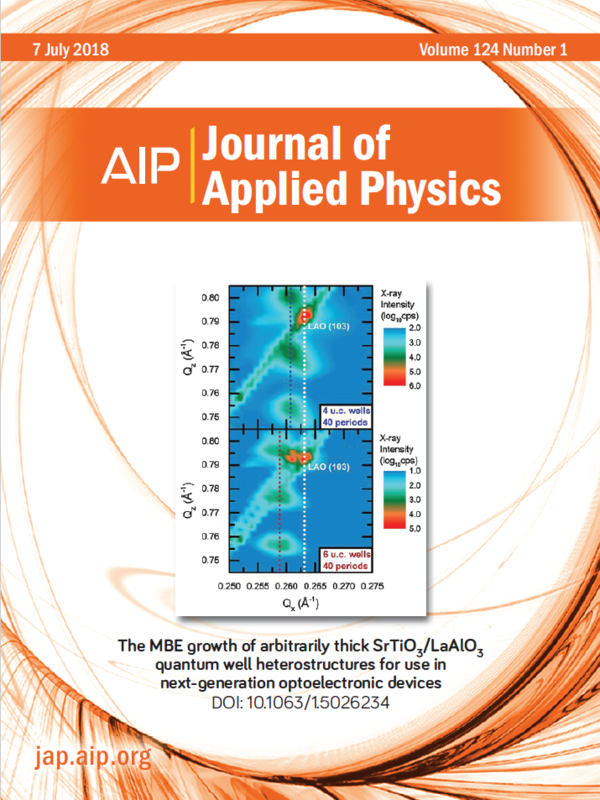 Our recent paper on STO/LAO quantum wells was featured on the cover of the July issue of the Journal of Applied Physics! Demkov group alumni Hosung Seo has accepted his first position as an Assistant Professor at Ajou University. He is also currently a Visiting Scholar at the University of Chicago's Institute for Molecular Engineering. Congratulations Hosung! Patrick's thesis was awarded the Best Thesis Award by the Physics Department for Summer 2017, the second one for the Demkov group this year. Congratulations Patrick! Congratulations Patrick, and best of luck at LAM Research! Kristy's thesis was awarded the Best Thesis Award by the Physics Department for Spring 2017. Congratulations Kristy! Congratulations Kristy, and best of luck at Intel! Kurt joins Applied Materials Congratulations to Demkov group alumni Kurt Fredrickson on his new position at Applied Materials! S. Abel, F. Eltes, J. E. Ortmann, A. Messner, P. Castera, T. Wagner, D. Urbonas, A. Rosa, A. M. Gutierrez, D. Tulli, P. Ma, B. Baeuerle, A. Josten, W. Heni, D. Caimi, A. A. Demkov, J. Leuthold, P. Sanchis, J. Fompeyrine, "Large Pockels effect in micro- and nano-structured barium titanate integrated on silicon," accepted Nature Materials (2018). S. Lu, K. J. Kormondy, A. A. Demkov and D. J. Smith, "An EELS signal-from-background separation algorithm for spectral line-scan/image," Ultramicroscopy 195, 25 (2018). K. J. Kormondy, Y. Cho, A. B. Posadas, L. Zheng, K. Lai, Q. Wang, M. J. Kim, Q. He, A. Y. Borisevich, M. C. Downer, and A. 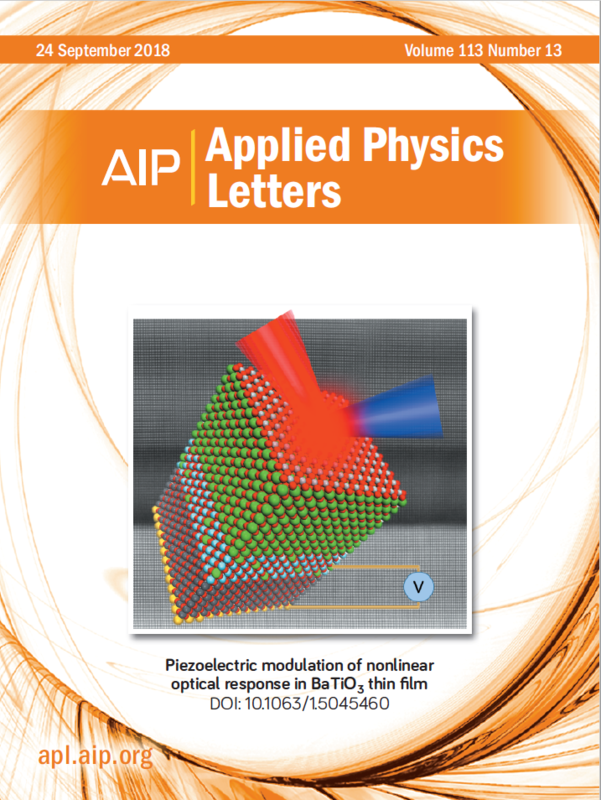 A. Demkov, "Piezoelectric modulation of nonlinear optical response in BaTiO3 thin film," Appl. Phys. Lett. 113, 132902 (2018). K. D. Fredrickson, V. V. Vogler-Neuling, K. J. Kormondy, D. Caimi, F. Eltes, M. Sousa, J. Fompeyrine, S. Abel, and A. A. Demkov, "Strain enhancement of the electro-optical response in BaTiO3 films integrated on Si (001)," Phys. Rev. B 98, 075136 (2018). S. Hu, L. Ji, P.-Y. Chen, B. I. Edmondson, H.-L. Chang, A. Posadas, H.-W. Wu, E. T. Yu, D. J. Smith, A. A. Demkov, and J. G. Ekerdt, "Crystalline SrZrO3 deposition on Ge (001) by atomic layer deposition for high-k dielectric applications," J. Appl. Phys. 124, 044102 (2018). J. E. Ortmann, N. Nookala, Q. He, L. Gao, C. Lin, A. B. Posadas, A. Y. Borisevich, M. A. Belkin, and A. A. Demkov, "Quantum confinement in oxide heterostructures: Room-temperature intersubband absorption in SrTiO3/LaAlO3 multiple quantum wells," ACS NANO 12, 7682 (2018). J. E. Ortmann, A. B. Posadas and A. A. Demkov, "The MBE growth of arbitrarily thick SrTiO3/LaAlO3 quantum well heterostructures for use in next-generation optoelectronic devices," J. Appl. Phys. 124, 015301 (2018). K. J. Kormondy, L. Gao, X. Li, S. Lu, A. B. Posadas, S. Shen, M. Tsoi, M. R. McCartney, D. J. Smith, J. Zhou, L. L. Lev, M. Husanu, V. N. Strocov, and A. A. Demkov, "Large positive linear magnetoresistance in the two-dimensional t2g electron gas at the EuO/SrTiO3 interface," Scientific Reports 8, 7721 (2018). P. Ponath, A. B. Posadas, M. Schmidt, A.-M. Kelleher, M. White, D. Oâ€™Connell, P. Hurley, R. Duffy and A. A. Demkov, "Monolithic integration of patterned BaTiO3 thin films on Ge wafers," J. Vac. Sci. and Technol. B 36 (2018). P. Ponath, A. K. Hamze, A. B. Posadas, S. Lu, H.-W. Wu, D. J. Smith, and A. A. Demkov, "Surface structure analysis of Eu Zintl template on Ge (001)," Surf. Sci. 674, 94 (2018).